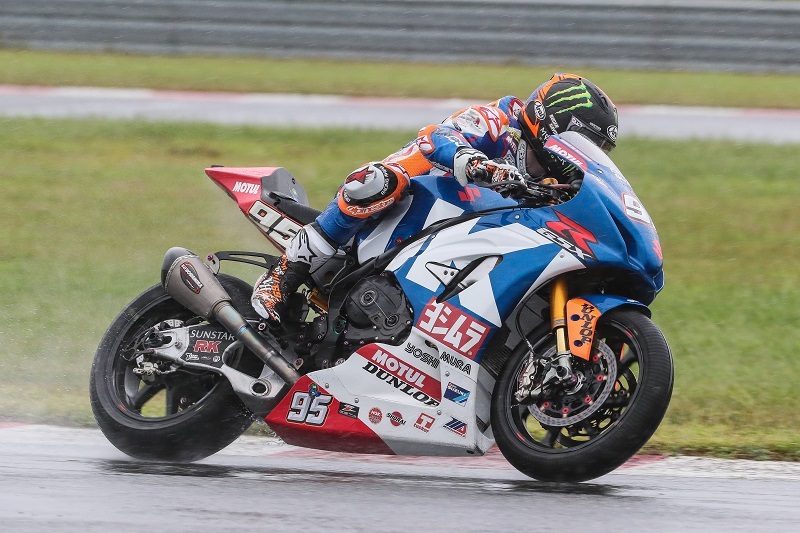 Brea, CA (September 9, 2018) – New Jersey Motorsports Park was drenched under the remnants of Tropical Storm Gordon, yet in spite of soaking conditions Yoshimura Suzuki Factory Racing’s Roger Hayden and Toni Elias both earned rostrum finishes in Sunday’s MotoAmerica Superbike race two. Hayden ran a steady race two on his Yoshimura Suzuki GSX-R1000 Superbike and finished runner up, earning his best result of the season. Elias made a come-from-behind charge running fifth in the early going before rallying to finish third. It was a strong turnaround after Saturday’s rain race in New Jersey that saw Hayden finishing fourth and Elias crashing while trying to move up from third. The 2018 MotoAmerica Superbike Championship was clinched by Cameron Beaubier after winning Sunday’s race. Both Elias and Hayden congratulated Beaubier for he and his team’s excellent season. Going into the final round Elias remains second in the standings, while Hayden’s solid weekend moved him up to seventh. “For me it was a great weekend,” said Hayden, who also qualified second in Superpole. ”I took fourth yesterday, but didn’t really feel that comfortable on the bike. The team made some changes overnight and today my bike was a lot better. The track was slicker and more treacherous today, but we managed to finish second. I’m pretty excited because I haven’t been on the podium in awhile and it’s great, especially for my guys. For Elias, his last hope of trying to chase down Beaubier in this year’s championship came to an end, but the 2017 MotoAmerica Champion is optimistic about winning back the No. 1 plate next season. “I want to congratulate Cameron for a great season,” Elias said. “We had some great battles this year and he and his team really stepped up their level. I gave it my best to try to keep the championship alive yesterday. I was trying to gain another position to earn back more points on Cameron when I pushed too hard and crashed. Today we came back to the podium and it was great to be up there with Roger. The 2018 MotoAmerica Superbike Championship wraps up with the final event in two weeks at Barber Motorsports Park in Birmingham, Alabama, on September 21-23. You can catch MotoAmerica racing action televised on beIN Sports.